Critical Link, a leader in embedded electronics solutions, announces its latest embedded imaging solution, the MityCAM-C50000. 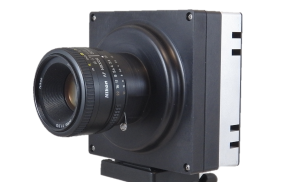 The new MityCAM-C50000 serves as the official evaluation platform for the CMV50000 CMOS image sensorfrom ams / CMOSIS. The global shutter sensor features 47.5MP resolution (7920 pixels x 6004 pixels) at 30 frames per second, with mono and RGB color options, low dark noise, and high dynamic range. The sensor outputs in subLVDS mode and provides special capabilities in binning, subsampling, and on-chip corrections. The MityCAM-C50000 provides multiple interfaces including USB3 Vision® and HDMI preview as standard, with custom options to include CoaXPress, Camera Link, GigE Vision®, and others. The system is based on an open architecture embedded processing design utilizing Critical Link’s MitySOM-A10S image processing board. The board features Intel’s Arria 10 SoC with dual core Cortex-A9 ARMs and up to 480KLE user-programmable FPGA fabric, DDR4 memory, and 12 high-speed transceiver pairs, making it an ideal solution for embedded vision and scientific imaging applications. The MityCAM-C50000 architecture supports a number of development tools, including OpenCL™ and high-level synthesis (HLS). This ensures that anyone who can code in C/C++ is able to work with the FPGA. OpenCL also enables software acceleration, generating significant improvement in application speed. Customers interested in the MityCAM-C50000 for evaluation of the CMV50000 sensor may connect with their local ams representative, or contact Critical Link via info@criticallink.com. Developers designing a custom system around the CMV50000 are encouraged to contact Critical Link before getting started to obtain design files and other helpful information. Critical Link’s engineering team is also available to assist with new development projects or customization of the MityCAM-C50000 design. To learn more about the MityCAM-C50000, visit https://www.criticallink.com/product/mitycam-c50000/.For information on the CMV50000 sensor from ams, visit https://ams.com/cmv50000. Syracuse, N.Y.-based Critical Link (www.criticallink.com) is an embedded system engineering firm providing system on modules (SOMs) and embedded imaging solutions for industrial performance applications. The company’s expertise in image sensor integration, system-on-chip (SoC) and field-programmable gate array (FPGA) designs, vision protocols, and signal processing has made it a leader in board-level solutions and custom designs for OEMs and embedded developers around the world. Critical Link is a Platinum Member of the Intel (Altera) FPGA Design Solutions Network and the Intel IoT Solutions Alliance, and is ISO 9001:2015 Registered by SRI Quality System Registrar. This entry was posted on Wednesday, January 23rd, 2019 at 3:53 pm and is filed under Advertiser, News.